Ted Wragg: "A tremendous loss"
One of the best known names in UK education, Professor Ted Wragg, has died following a heart attack. He was taken ill while jogging on Sunday and died in hospital in the early hours of Thursday. He was 67. Edward Conrad Wragg, a former teacher and head teacher, retired from Exeter University's school of education in 2003 after 32 years. He had remained emeritus professor there and had continued as a writer, lecturer, broadcaster and adviser. In a statement, his family said they were deeply distressed and hoped everyone would understand their need for privacy. He would have a family funeral. A memorial service for friends and colleagues would be held shortly. "We know that Ted had many admirers throughout the UK and the rest of the world and we are enormously proud of his contribution to education," they added. He is survived by his wife Judith, children Josie, Caroline and Chris, his mother Maria, and his three grandchildren, Oliver, Harry and Harriet. Exeter's vice-chancellor, Steve Smith, said: "This is a huge shock. "Ted was not only a world class academic, but he was also the life and soul of the university. "He had the respect of teachers, of academics, of policymakers and the media. "He cared passionately about children and it angered him when people tried to write them off at an early age." Prof Smith added: "He is irreplaceable." Education Secretary Ruth Kelly said: Ms Kelly said: "His tremendous passion, knowledge and wit drawn from a working life dedicated to teaching meant his contribution to the profession was immense and his views could never be ignored." The chief executive of the Qualifications and Curriculum Authority, Ken Boston, said Ted Wragg had been "a giant of a man" as an educator. "He was known nationally and internationally, his newspaper columns were widely read and he'll be missed by educators around the Western world. "Ted spoke with a great authenticity, as a man who had his roots in the classroom. I have never come across someone with such a rich understanding of classrooms and children. "For over six years he made a tremendous contribution to the board of the Qualifications and Curriculum Authority, and his influence on education in this country will last for many years. I will miss him greatly." The general secretary of the National Union of Teachers, Steve Sinnott, said Ted Wragg had been "a champion of teachers, a champion of children and a champion of the education service". "He towered over education for the last 30 years, seeking always to promote the interests of every single child and to support teachers in their efforts to provide the best education possible." Dr Mary Bousted of the Association of Teachers and Lecturers said: "Ted Wragg delighted teachers by his supreme ability to dissect the inconsistencies and incoherencies of politicians and public servants. "His experience and knowledge, and his devastating wit will be missed by everyone, apart from those whose pomposities he so ably exposed." John Dunford of the Secondary Heads Association, said Prof Wragg's death was "a great loss". "He was unique in his ability to cut through all the nonsense that teachers have had to put up with for many years," he said. Shadow education secretary David Cameron said Ted Wragg had made an enormous contribution to the education debate in the UK throughout his distinguished career. "Often controversial but always of interest, his views have inspired and provoked in equal measure." An e-mail address has been set up by Exeter University for messages of condolence at education@exeter.ac.uk. Ted was always a strong supporter of sport, especially football and was often on the touchline for University of Exeter matches in the Axworthys Devon League. A minute's silence will be held before the University's match on Saturday away at Newton Abbot Spurs. I was taught by Ted Wragg in the late 60s when he was head of German at Wyggeston Grammar School, Leicester. This period in his career never seems to be mentioned in the tributes. Not surprisingly, he didn't stay long because a man of his talents didn't hang around in the class-room. He was an inspiring teacher and I am lucky our paths crossed, because I went on to study German at university. His teaching style was effortless, his classroom control flawless, his humour still memorable. Even back then, he showed his sympathies lay with the pupils. Outside the classroom he shared his enthusiasm for football in a school where rugby held sway. There were no goalposts on the extensive school playing fields, so he gathered together a group of football-mad fourth formers and took them off to practise on the nearby Victoria Park pitches, later forming a team. Sadly missed. I met Ted on a few occasions usually when I was speaking at a head teachers' conference as his 'warm up' or trying the impossible task of following him after he had spoken. He will be missed not just for his considerable knowledge of schools, teachers and children and what makes a difference to all of them but for the way he was prepared to challenge. He was always on the side of those at the 'coal face' even when it was fashionable to see those doing the job everyday as the problem in raising standards rather than a crucial part of the solution. On 21 October Ted Wragg spoke to the teachers and support staff of schools in the Bromley Learning Alliance. His enthusiastic wisdom inspired a whole workforce and many who heard him for the first time were looking forward to more. The world of education is a poorer place from today. I had the pleasure of attending many of Ted's lectures whilst studying my PGCE course at Exeter and was able to speak to him in person on one occasion. He was such a caring and interesting man...and also very witty! He had the kind of voice and delivery which you could listen to for hours withour getting a bit bored. What a loss! Ted was a first class researcher as well as a fine speaker and writer. He had the rare ability to be able to work both with those in high office, when they let him, and those just starting out on their careers in education. His death, so untimely and unexpected, has deprived us all of one of the best known figures in education. I went to Exeter to do my PGCE in 2002-3. Ted Wragg lectures were always brilliant. He was tne type of teacher that we all aspired to be! I was lucky enough to get to know Ted on a personal level as he helped out with the coaching of the Uni football team - he was nearly as passionate about the game as he was teaching. Ive just found out and I am gutted. Don't know if Ill be able to teach next period, but I'll do it - bottling lessons wasnt the Ted Wragg way! Thanks for all your help - you will be sorely missed mate. One of the sad days in education. The news has spread through our school like a death in the family. One of our heroes has gone. Who will pick up the banner when the next crop of educational terrorists come along ? Well done Ted, we honour you. My wife and I were shocked and distressed to hear the news of Ted Wragg's sudden death. 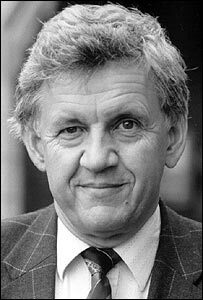 We had known him in Nottingham when he was Professor of Education and I was a local authority inspector - we had a common interest in Modern Language teaching. ... He was the voice of reason in an educational world where doctrinaire prejudice and political manoeuvring seem to have crowded out the realities of good classroom practice. His energy, humour and genuine concern for learners and teachers set an example for all who aspire to leadership in education. We offer our condolances to his family and friends. Ted was perhaps the best known of Routledge's Journal Editors, having edited 'Research Papers in Education' for many years. We are deeply saddened by his death. Our thoughts are with his family and friends at this time. I remember talking to Ted in Exeter one saturday morning when he was out jogging in a Newcastle football shirt. Even to a student teacher Ted never seemed intimidating partly because of his humour, but partly because you always felt that he was on your side. He will be sadly missed. Feeling a bit lost at the thought of this champion not being around to speak so clearly for us any more. Enjoyed times with him over the years as a young teacher, supporting parental involvement,judging the national teacher awards and more recently helping him with his ageing computer to take part in the NCSL online community. A real void. Thanks Ted. Deeply saddened to hear of Ted's death. Undergraduates are not particularly known for their dedication to getting up early to get to lectures but if Ted was on, the wit, erudition and sense of passion got us all there. I remember Ted coming to my school in Torquay and taking us for some lessons. Didn't mean much to me then of course. The fact that I remember his lessons some 35 years later says more about him than my memory! Of course I saw him again in the recent TV programmes and it was clear that he had lost none of his passion for education and young people. I'm sure thousands of others feel the same way and he'll be a great loss to education. I was a PGCE student at Exeter when Professor Wragg arrived. He was one of my general tutors for a while and I always found him an interesting speaker. Over the years he has been a voice of common sense when education has suffered from the whims of assorted political masters. Professor Wragg came to speak at our Heads' Conference only 10 days ago and was wonderful, full of sense and cynicism, and brought us back to the reality of what teaching is all about! He will be very much missed. There will be sadness in every staff room in every school in the country. We have lost a great friend and a great champion of the belief that a child is not a vase to be filled but a fire to be lit. He gave to voice to our anger and often made us laugh at the same time. The teaching profession has lost one of its true champions. A sad and premature loss to the world of education. I admired his belief in education and his in-built crap detector. Ted combined great intellect with a superb sense of humour. He cut through the jargon and goobledegook of government spin doctors and told it like it is. He will be greatly missed, not just as an educatione expert but as a raconteur and wit. The death of Ted Wragg will be a great loss to education. He clearly understood what education is really about - not tests, league tables, parent power or any other 'Soundbite' but about helping children and young people grow into mature, well-rounded members of society. Ted Wragg's wry, wise words and blisteringly argued articles were a constant reminder that we should have faith in children and hold on to a bigger vision of education, even when surrounded by looming clouds of political posturing and governmental diktats. Ted Wragg's generous voice gave people hope - and I fear it will be very greatly missed, and very much needed. Penny Dolan, Harrogate, Yorkshire, England. We were very pleased and honoured to present Professor Wragg with an honorary doctoral degree only last week at Exeter Cathedral as a part of our Faculty of Education award ceremony (University of Plymouth). Recipients of such awards do not generally give speeches. In Ted's case however, there was a departure from tradition. He gave a memorable, humorous and inspiring speech to the graduates and staff, and was given a standing ovation by many of the platform party. This turned out sadly to be one of his last public speeches. Professor Ted Wragg will be sadly missed, and will leave a considerable vaccuum which will be hard to fill. Our thoughts are with his family at this time. Ladies and gentlemen, raise your glasses to a great man. Ted Wragg was a no-nonsense genuine expert on education with some smart ideas and no time for the silliness we teachers encounter on a day-to-day basis. His ideas were good, his TES column was consistently entertaining and he will be sadly missed by many in the profession. Farewell, Ted. Ted Wragg was one of my lecturers when I did my PGCE in '96-'97. His passion for teaching and young people was evident and inspiring, and his TES column was always fun but thought-provoking. I am shocked and saddened to hear of his death - the profession will miss him greatly. Teachers and educators everywhere are the poorer for Prof. Wragg's passing. His TES column was sensible,reasonable and a jolly good read.We now have one less voice to counter the Kellys and the Woodheads of this world. I am sorry to hear that Ted Wragg has died but I sometimes felt his ideas on education were impractical or downright wrong. He became something of a guru and my teacher trainers treated his word as gospel. I chose not to. Please, don't laud him too highly. He was not perfect. It is a very sad day for the teaching profession. We have lost one of the very few sensible people in the field of education who was always an inspiration and also gave us hope in the face of unworkable political initiatives. You will be really missed Ted - thank you so much for all you have done over the years. It was a privilege to meet, hear and learn from the wonderful, charismatic and truly unique Ted Wragg. His fantastic commitment to all aspects of education leaves us a huge legacy and his particular support for the development of the powerful international dimensions of education is one that we should all be very grateful for. Thank you Ted - you will be greatly missed. At root, Ted was simply a wonderful teacher. He had a life-changing impact on my attitude to learning when, in the early 1960s, he introduced general studies into a traditional direct-grant grammar school curriculum. And, I now realise, he was under age 25 when he did it. Thank you Ted. Ted Wragg's 'Flying Boot' series of reading books were the only reading books my autistic son would learn to read with. It is very sad that a voice of reason has gone. His columns were sometimes hilarious. The world of education has lost a true champion. Ted Wragg voiced, for many years, the concerns and aspirations of a generation of teachers. We will not see his like again. Really sad to hear this news.. Ted should have had a long and happpy retirement. I was a student at Exeter Uni, and although the education department was on a different site, I was aware of his name, as he was spoken very well of. Totally respected and admired. This will be said by others but while I worked at Phoenix High School, where teachers were not always viewed favourably by the press, I felt supported by the views and attitudes of Prof. Wragg. A great loss to teachers in this still changing world of teaching. It was Ted who named our company, when he coined the term 'Chalkface' in his TES column in 1989. We felt that our values as publishers were closely aligned to his as an educator, and wanted to make that link visible. It stood us in good stead over the years. Thanks Ted, you will be sorely missed. Ted's perceptive and witty TES column helped me through my probationary year and a few subsequent 'grim Fridays'. Thank you! I met Ted when I was leaving school in 1998 he came to our presentation evening, and he possessed something most people lack today, he cared, was wise, and of course very witty. Had much respect for the man. Condolences to his family and closest friends. Dave Latham, South Molton, Devon, UKTed's death is such a sad loss to the teaching profession. He understood primary education and what was in the best interests of the pupils. His views were always backed up with evidence. He usually took the opposite view to that of the government. I found it so comforting to hear him speak he confirmed that my views on education were right and gave me confidence to follow my beliefs. Bravo Ted! At the back of the TES, you shone the only light seen in the long night of political ghouls. There'll be glasses raised tonight, in thanks. Ted will be a great loss to education. His work will however, live on through those he inspired. Hopefuly this will bring some comfort to his family and friends. During my early years of teaching, Ted Wragg's columns in the TES always provided me with a much needed source of amusement and wisdom combined. In later years, I icame to ncreasingly value his experience and insight into education in the UK today. A genuine voice of reason has been lost to us today. Best wishes to you Ted. Ted truly was inspirational - and a nice bloke! What a loss to our profession. When I met him, a few times over the past few years, he was never anything but kind, decent and incredibly funny. ... Not many people know that he has written for TV in a non-educational capacity, e.g. for Rory Bremner, whose comment on one of Ted's last books sums it all up "His humour is a tonic and an inspiration: the sort that has you gnashing your teeth with rage one minute and clutching your sides with laughter the next." My condolences to his immediate family and Ted's wider family, all those in the teaching profession. Oh dear, oh dear... Ted Wragg is too valuable an asset to have gone! With wit, with barely concealed anger, he was a necessary thorn in the side of the likes of Ofsted and the purveyors of educational nonsense. I cannot begin to imagine who may take up his sword. My condolences to his nearest and dearest who I am sure were proud of him. I was lucky enough to be lectured at by Ted Wragg when he became Emeritus Professor at Exeter University. He was an extremely witty person but also obviously had enormous compassion. Alas the fact that I agreed with his incisive view of the education system in this country and the games politicians played with it was one reason I didn't stay the course, but I had the highest respect for him. What a shame, I am shocked at his sudden death. Fridays will never be the same, Ted's TES back page column always helped put things into perspective, bring me back down to earth and laugh. he will be sadly missed. We shouldn't forget that as well as being very funny he was also very intelligent. There was a deep insight behind the irony and satire which was what made it so effective. I'm a parent with two children at Primary School and have been growing increasingly concerned at the direction education policy has been taking. Ted Wragg was a beacon of hope to me, and a very human voice in a world dominated by the interests of big business. I shall miss him greatly. I met Ted briefly at a party, and just said thank you for keeping up my spirits every other Friday, during the Thatcher years and subsequently. I'm glad I had the chance. He probably did more for teacher retention by making us laugh at DfES idiocy than any of the DfES initiatives. We were enormously privileged to have worked closely with Ted through his major on-screen contribution to the launch of Teachers' TV. As everyone knows he was a TV natural, but his work on the channel was outstanding. Brilliant interviews with some of the biggest names in education who gave so much more because they not only respected him but they liked him, even when he put them on the spot. He was a voice that all teachers could identify with as they recognized his deep knowledge of the craft of teaching and his fierce independence of spirit. We will miss him horribly. Ted was a real inspiration when I was training to be a teacher in the 1970s. His lectures were accessible to everyone, he had a great sense of humour, seemed genuinely interested in the opinions of others and really cared about children and their education. Very sad to learn of his early demise. Many years ago my life had got stuck; living without purpose in the wilds of the Black Forest but dreading imminent return to UK - no career, little prospects. Heard Ted Wragg on BBC World Service and wrote to him from the wide blue yonder; received positive response combined with good advice by return; didn't always follow it but survived ... this bloke was an inspiration to the common man. Goodbye, Ted, and thanks. A sad loss of a becaon of sanity. I shall miss his columns in The Guardian immensely, which were so often well-written common sense (or should that be rare sense, given that there is so little of it about?). Ted touched our lives in many profound ways. He was associated briefly with our charity (The University of the First Age) and we were inspired by his ability to summarise expansive ideas with such simplicity, humour, and the ability to find the right story. Ted always rooted for the young people and the professionals who worked with them and was quick to cut through waffle and irrelevancies. Ted modelled for us care, wisdom, and passion for the job in hand in a manner that is sadly lacking in much of the world around us and his loss will be felt deeply. Our thoughts are with his family and friends. Ted Wragg was the voice of educational sanity in an increasingly insane world. The world of education be a poorer place without his wit and humour. Not only that, his vision and commitment to the principles of state education - principles which the current government are abandoning rapidly - make his loss even more sad. I'm sure many people who work in education felt that they knew him, so familiar a presence as he was. I used to know Ted Wragg when I worked at the BBC during the 1990s. He chaired the advisory panel, but what a lovely man: wise, human, "real", interested in everyone and with no grandiosity. What a rare combination, and what a shame - and a shock - to learn of his early death. A great loss, nothing more can be said. The following "short" CV of Prof Ted Wragg was released by Exeter University. His family agreed to our reproducing it as an illustration of the range of his work and experience. E C Wragg (2001) Class Management in the Primary School, Routledge Falmer. E C Wragg (2001) Class Management in the Secondary School, Routledge Falmer. E C Wragg (2001) Assessment and Learning in the Primary School, Routledge Falmer. E C Wragg (2001) Assessment and Learning in the Secondary School, Routledge Falmer. E C Wragg and G Brown (2001) Explaining in the Primary School, Routledge Falmer. E C Wragg and G Brown (2001) Explaining in the Secondary School, Routledge Falmer. E C Wragg and G Brown (2001) Questioning in the Primary School, Routledge Falmer. E C Wragg, G Brown (2001) Questioning in the Secondary School, Routledge Falmer. E C Wragg, G S Haynes, Wragg, C M and Chamberlin, R P (2004) Performance Pay for Teachers, Routledge Falmer. E C Wragg (Ed) (2004) Teaching and Learning, RoutledgeFalmer. E C Wragg (Ed) (2005) Letters to the Prime Minister, Central Books. E C Wragg (2005) (in press) The Art and Science of Teaching and Learning, Routledge. Editor of the international research journal Research Papers in Education (Taylor and Francis) since 1986. Several of these have been translated into Chinese, Arabic, Spanish, Portuguese, Greek, Polish, Indonesian, Sri Lankan. Plus over 800 articles in books, research and professional journals, newspapers, and conference presentations. Regular columnist in the Guardian and Times Educational Supplement. Taught all years of the undergraduate course and postgraduates in the university, lectured at about 20 national and international conferences a year, and regularly taught in local primary and secondary schools, including a GCSE class and a reception class last year. Major innovator in teaching. PGCE course in educational studies, first developed in the 1970s and 1980s, widely copied in other universities. Significant developments in educational technology include two CD ROMs, and two DVD ROMs for the Teacher Training Agency on 'Teachers' Questioning' and 'First Encounters'. Presenter of and contributor to numerous radio and TV series and items on education, including Chalkface (Granada), Crisis in Education (BBC), The Education Roadshow (BBC), The Education Programme (BBC), Pebble Mill at One (BBC), Teaching Today (BBC), Panorama, BBC News, News at Ten, Channel 4 News, Sky News, You and Yours, Today, File on Four, World in Action, Weekend World, PM, The Moral Maze, The Jonathan Dimbleby Programme, Any Questions etc. Currently presenter of three series on Teachers' TV, including the innovative 'Hot Research', which brings research findings to teachers.